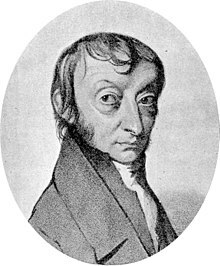 Amedeo Avogadro (9 August 1776, Turin, Piedmont – 9 July 1856) was an Italian scientist. He is most famous for his contributions to molecular theory. The number of elementary entities (atoms, molecules, ions or other particles) in 1 mole of a substance, 7023602214179000000♠6.02214179(30)×1023, is known as the Avogadro constant. ↑ "Amadeo Avogadro 1776-1856". Education in Chemistry. Retrieved 2018-01-24. ↑ User, Super. "Amadeo Avogadro". www.moleday.org. Retrieved 2018-01-24. This page was last changed on 8 February 2018, at 08:24.